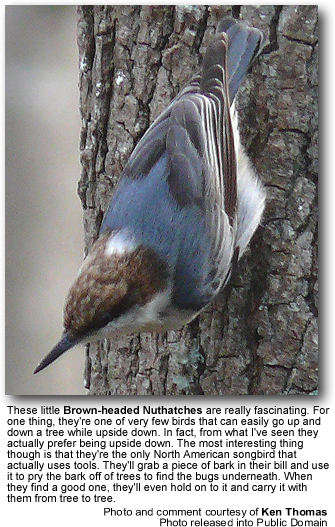 The Brown-headed Nuthatch (Sitta pusilla) calls the pine forest of the southeastern United States its home. It lives there year-round, and also inhabits parts of northeastern Texas, middle Tennessee, east into southern Pennsylvania. The highest breeding densities are in western South Carolina and Georgia, central Florida, and southern Mississippi. Old growth, mature pines are the preferred habitat of this species, so much so that they dwell in these stands almost exclusively. The birds spend their lives in their territories. They choose older pine forests for breeding; the loblolly-shortleaf pines (a pine with flaky bark and long needles, grouped in three’s, and oblong cones) and longleaf slash pines (pines found in swampy areas) attract the highest populations. This species does not migrate, remaining instead close to its breeding range. This bird, like the Pygmy Nuthatch, has a short tail, a large head and a long bill. This is a small bird, whose body length is just 4.25 inches. True to its name, the Brown-headed displays a shade of brown on the top of its head and a splash of white on its nape. It has a narrow, black eye stripe, and his cheeks, chin and belly are white. The wings are a blue-gray. This Nuthatch breeds between February and April. They utilize snags (standing dead trees) for nesting and roosting. They choose older pine stands rather than younger stands; sometimes they will utilize burned stands. The female excavates cavities in trees. She then incubates for two weeks, and the chicks fledge a week later. Birds are extremely intelligent creatures. Some have even mastered the ability to use tools. The Brown-headed Nuthatch will take a piece of tree bark and use it as a lever to pry up other flakes of tree bark in its search for food. He will then carry his makeshift pry bar to other trees to find food there or uncover his hidden cache of seeds. He generally forages in live pines, finding cockroaches, beetles and spiders in the warmer seasons and different types of arthropods and pine seeds in the colder seasons. The Brown-headed Nuthatch gives a high sharp, nasal two-syllable vocalization, often followed by a rapid series of lower nasal notes.